The centerpiece for any party is the cake. Give yours a modern look with an ombré design in your favorite colors, create this look in two easy steps. Got a springtime celebration or butterfly buddy? Pre-bake a flutter of butterfly cookies and allow guests to decorate their own party favors. Toast to a fabulous year with this easy no-bake "mock-tail" recipe. These cupcakes are a whimsical way to celebrate with friends and family. Birthdays are all about the birthday cake! Color coordinate with your theme using Jelly Belly jelly beans. Celebrate the "big screen" with our blockbuster flavor, Buttered Popcorn, as "popcorn kernels" on cupcakes. Here’s a sweet way to bring the stars down to earth. Decorate star-shaped cookies with the Jelly Belly jelly beans to add extra sparkle to each cookie. The classic chocolate bark gets a splash of color from a swirl of food coloring and a handful of Jewel Jelly Belly jelly beans for extra shine. Make this salty and sweet snack for any party. Using popcorn and your favorite mix of Jelly Belly jelly beans for the perfect combination. Bake an oversized cookie and decorate using Jelly Belly jelly beans, Candy Corn and gummi candies for a sweet "pizza" spin. Kids will love decorating these fun and festive holiday treats. Use your favorite box mix, homemade recipe, or try our recipe. This easy and delicious craft is a fun party activity, or the cheerful centerpiece of your neighborhood cookie plate. Fill, frost, repeat! Deck the cakes with loads of candy! The holiday season is even sweeter with Jelly Belly ornaments adorning a cupcake tree. Jelly Belly beans hidden inside homemade chocolate balls make for a sweet holiday surprise. It’s as easy as melting chocolate! The great thing about making a wreath is that you can make it as large or as small as you like. Just remember to have plenty of Jelly Belly® jelly beans on hand! 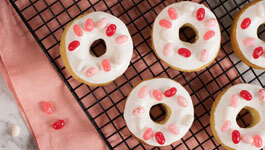 Give a homemade look to store-bought baked goods with some simple icing and Jelly Belly jelly beans of your choice. The kids will delight in becoming Santa's helpers this holiday season when they decorate a gingerbread sleigh dashing through candy snow. Jelly Belly Peppermint Bark Extravaganza! A great treat to share with loved ones and keep for yourself! Celebrate spring with this gorgeous cake, the perfect finishing touch for parties, bridal showers and other festive occasions. These delightful treats decorated with your favorite Jelly Belly jelly beans are bound to bring smiles. Dazzle your friends and family with these charming Bunny Cupcakes! Use egg-shaped cookie cutters to create these festive Easter egg petit fours. By the bouquet or by the bite, cake pops have never been sweeter or easier. 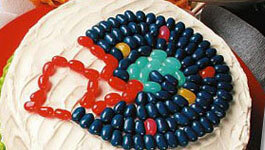 DIY wreath made with single flavors of Jelly Belly beans will entice the Easter Bunny to your door. Light bites of salty and sweet inspired by popcorn drizzled with white chocolate. Stir in one flavor of Jelly Belly beans or a favorite flavor collection. White chocolate molded into flower pops are embellished with Jelly Belly jelly beans. Fill vases with jelly beans to display the pops. A springtime delight that combines the decadence of chocolate ganache, fresh strawberries and Jelly Belly jelly beans for garnish. Surprise guests with Jelly Belly jelly beans hidden inside a white chocolate ball. Let your dessert table bloom with flower-themed cupcakes. Bake cupcakes in varying sizes from mini to large for a whimsical garden-like presentation. Coconut cookies become spring nests for Jelly Belly beans. Lighten things up with an airy nest of meringue dotted with Jelly Belly beans and topped with a refreshing scoop of any fruit sorbet. Gather the family make Easter memories decorating Easter Bunny Cookies. Any seasonally shaped cookie will work here – chicks, eggs, etc. These cute cupcakes are anything but pests! Express your love with these inspiring desserts, and charm your way into hearts everywhere. Transform your favorite brownie recipe or mix into a love-inspired treat. Decorate with Jelly Belly beans and send X’s and O’s to someone special. Make these for birthday parties, brunches, showers and other celebrations. Decorate with your favorite Jelly Belly jelly beans on top! Your special someone will L-O-V-E this delicious treat topped with their favorites from the Jelly Belly® Valentine Mix! If your sweetheart has a sweet tooth, create these beautiful cupcakes with an assortment of jelly beans and confections and watch the sparks fly! Spooky creatures have never been this tasty! Jelly Belly jelly beans and Confections make these cupcakes perfect for any Halloween party. Don’t carve – just bite! Covered in orange-colored jelly beans, these Halloween cupcakes take on a new appearance. A-maize your crowd with this crafty centerpiece inspired by the dried harvest corn decorations that grace doorways each fall. These will be the hit of your Halloween party. Stir in Candy Corn with a batch of caramel corn, then serve in tri-colored cones for easy munching! Combine your favorite snacks with jelly beans to put a unique spin on your party mix. Just try to save some for your guests! Perfect for Halloween party! Show a ton of spirit with this cake decorated with your favorite football team's colors. 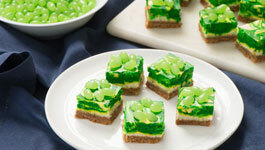 Refreshing and rich key lime cheesecake takes on a festive swirl, and Jelly Belly beans add the perfect finishing touch.